FULTON – Each Fall, the Veterans Council of Fulton chooses a Veteran of the Year. This year we honor Garry Visconti for his dedication and service to our country. A veteran of the Navy, his service spanned two decades with assignments both in the western Pacific Ocean and the areas surrounding the Mediterranean Sea. During his second Mediterranean assignment, he achieved the rank of chief petty officer, a seventh enlisted rank position, for his technical and leadership skills. In 1994, President Bill Clinton gave Visconti a Navy achievement award for his role in Operation Uphold Democracy. 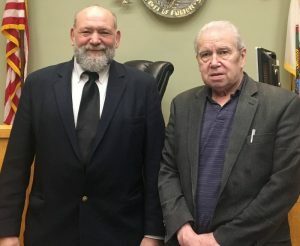 As the 2019 Veteran of the Year, Visconti will be the grand marshal of the Memorial Day Salute Parade on May 25. The parade and event is proudly supported by the Fulton Kiwanis, Lions, Noon Rotary, and Sunrise Rotary service clubs and the Veterans Council. The Memorial Day Salute Committee invites the community to join us in honoring Visconti and all the servicemen and women for their extraordinary service and sacrifices. To participate in the parade please visit www.fultonmemorialdaysalute.com and complete a float and attractions application or contact the parade coordinator at 315-806-0250.